COLOR(S):Any shade of chocolate or gray. Tan and white may appear on tail tip, feet, chest, and as a blaze. An ancestor of the Old English Sheepdog, the highly intelligent Bearded Collie is a resourceful, stable and self-confident breed. Their most distinct characteristic is their long, shaggy coat and short muzzle. They are muscular, medium-sized dogs, making them hardy, robust and active. With an aura of strength mixed with adept agility, Bearded Collies are exceptional working dogs with high natural, guarding instincts. As family dogs, they translate their instincts for guarding a flock to guarding their family. They are very stable dogs that are outstanding family companions who show no signs of aggression or shyness. Easy to train for many activities and a perfect companion for children, the Bearded Collie is a playful, intelligent and enthusiastic family addition. This breed is self-confident, stable and exuberant and will likely charm you with its natural happy-go-lucky ways. They love people and, as such, should not be left alone with nothing to do. Bearded Collies make good watchdogs with strong barks. They are good working dogs with a strong herding instinct toward people and animals. Obedience training is definitely suggested since the breed can be headstrong at times. While Beardies are not aggressive or shy, males will tend to be more outgoing and bold than females who are generally more submissive and calm. Bearded Collies generally experience a changing of coat color throughout their life. As puppies, Beardies usually have blue, brown, black or fawn colored coats with or without white markings. This will usually darken as the dog matures to blue, brown, black or fawn. The final coat color of this breed tends to be somewhere between the color of the puppy coat and that of the yearling coat. 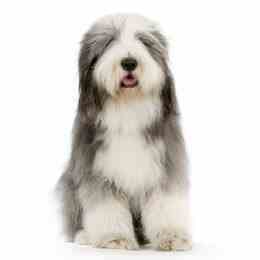 Bearded Collies can suffer from health concerns including hip dysplasia, hypothyroidism, epilepsy or colonic disease. This breed is also known to experience allergies, skin problems and autoimmune disease. With natural herding instincts, Bearded Collies love running free. They require plenty of daily exercise and enjoy the opportunity to run in open spaces. Bearded Collies have a loud bark and are known to bark at anything anytime. Training puppies at an early age not to bark is recommended for this breed. Beardies do well with obedience training as well as in competition, agility work, and herding.